General hockey observers might not think a matchup between the two teams at the bottom of the NCHC heap would be particularly compelling. Yet the narrative percolating around this weekend’s matchup between UNO (8-16-2 overall, 4-11-1-1 in the NCHC) and Miami (9-15-4 overall, 3-11-2-1 in the NCHC) has its intrigues. Two conference points separate Omaha (14 points) and Miami (12 points), who are seventh and eighth in the standings, respectively. With six points on the line this weekend — and Colorado College sitting in sixth place at 17 points — things are in flux as teams jockey for conference playoff positions. Fans on the Internet have spent considerable time this season mulling over the departure of former UNO assistant Peter Mannino, who went to Miami after the 2017-18 season. It would likely be a non-story if a handful of Mannino’s UNO recruits hadn’t decided to join him in balmy Oxford, OH. Miami Coach Enrico Blasi’s RedHawks made the NCAA tournament eight straight seasons prior to the start of NCHC play in 2013 — including a wildly entertaining national title game against Boston University in the 2009 Frozen Four. 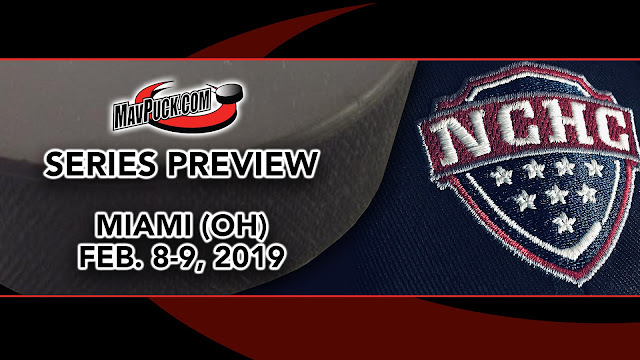 In the intervening years, Miami has had just one winning season (2014-15), and has struggled to regain the prowess they had during the CCHA days. During the Dean Blais era (and Mike Gabinet’s first season at the helm in 2017-18), UNO tallied 17-plus wins in all but one season (2011-12). UNO has struggled achieve consistency this season — winning 4 of the past 14 games. Miami is in even worse shape, going winless in its last 14 (the lone victory an exhibition win against the Guelph Gryphons). The two teams split the series on Nov. 2-3 at Baxter Arena. On paper, you would presume UNO had the upper hand in the matchup in Oxford this weekend. However, you never know what might happen in a scuffle between teams struggling to improve totals in the win column. Next up: The UNO Hockey team is back at Baxter Arena on Feb. 22-23, facing top-ranked St. Cloud State.